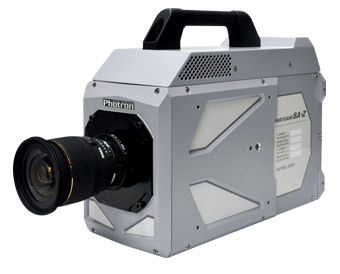 The Photron FASTCAM SA-Z offers scientists, researchers and engineers the ability to capture high resolution digital images at ultra-high speeds to see and understand previously invisible processes and events. Using Photron’s proprietary CMOS image sensor technology, the FASTCAM SA-Z combines high recording rates with outstanding light sensitivity and excellent image quality to provide the most versatile ultra-high speed digital camera available today. The ultra-high speed FASTCAM SA-Z provides megapixel image resolution at frame rates up to 21,000 frames per second (fps) from its highly light sensitive image sensor (monochrome ISO 50,000) with 12-bit dynamic range delivering the ultimate imaging performance. The FASTCAM SA-Z provides frame rates greater than 2 million fps at reduced image resolution and shutter speeds as short as 159 nanoseconds (export restrictions may apply). An innovative camera body design exploiting heat-pipe technology provides a thermally stable and reliable high-speed imaging system suitable for use in the most challenging environments. Available in 12-bit monochrome or 36-bit color versions with recording memory options from 8GB to 128GB, the FASTCAM SA-Z offers versatility of use in a wide range of scientific and industrial applications. Standard operational features of the FASTCAM SA-Z include a mechanical shutter to allow remote system calibration, dual-channel Gigabit Ethernet Interface for fast image download, and internal memory card drives allowing image download and storage to low cost removable recording media. The system also features memory segmentation to allow recording in one memory partition while at the same time downloading a previous recording, and the ability to remotely switch off cooling fans to eliminate vibration when recording at high magnifications. FASTCAM SA-Z is optionally available with the FASTDrive removable SSD drive permitting high-speed transfer of image data from camera recording memory to removable mass storage media enabling repeated recordings to be made in quick succession without the delays associated with download of data to a PC.